“Let them eat cake!” That’s what newly weds and their guests do at wedding receptions. 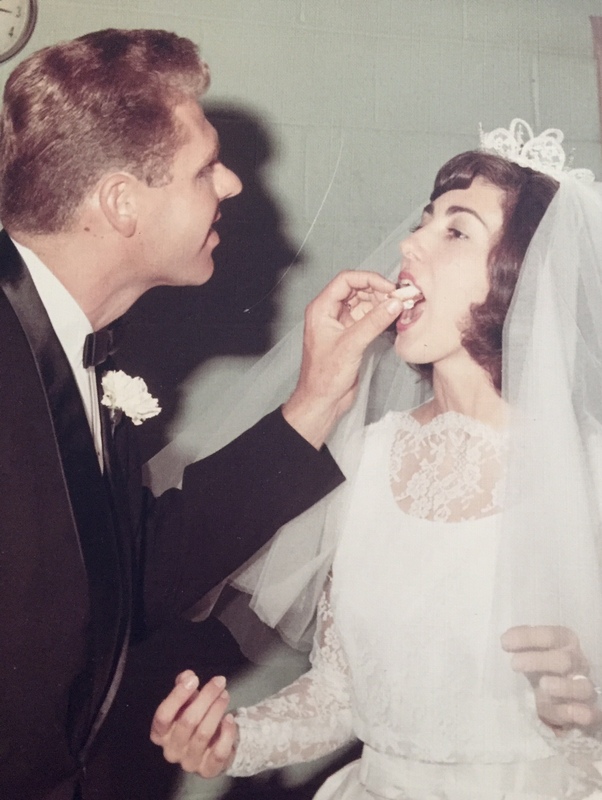 At 9 ½ minutes after three o’clock on August 5, 1967, I fed my groom a huge mouthful of cake, and he returned the favor more gingerly ten seconds later, if the clock on the wall is any indication. We are on the verge of celebrating our 49th anniversary. Like the seventh note in an octave, we are almost there, but have not yet reached the golden mark. Cake is sweet to the tongue just as our words should be to one another. Words have power. Let your spouse or partner hear “please” and ”thank you” every day. Sarcasm is out. Surely contempt must go. Public humiliation, a big NO! Say “Yes” as often as humanly possible. Wait for the best time to make a request, offer a suggestion. Everyone needs 5-10 minutes to decompress after walking through the door. Let your spouse have time to breathe before requiring a response. Once a day, notice the positive out loud: the way they look, something they’ve said, or done. With love in the loving cup. Whenever you’re wrong, admit it. Whenever you’re right, shut up! This candle first flickered and then burned brightly on a pedestal at Calvary Presbyterian Church in Charlotte, North Carolina. The candle came with instructions to burn for one hour on our anniversary date. Some years the candle probably has shone for more than an hour. But we may have even skipped a year or two. 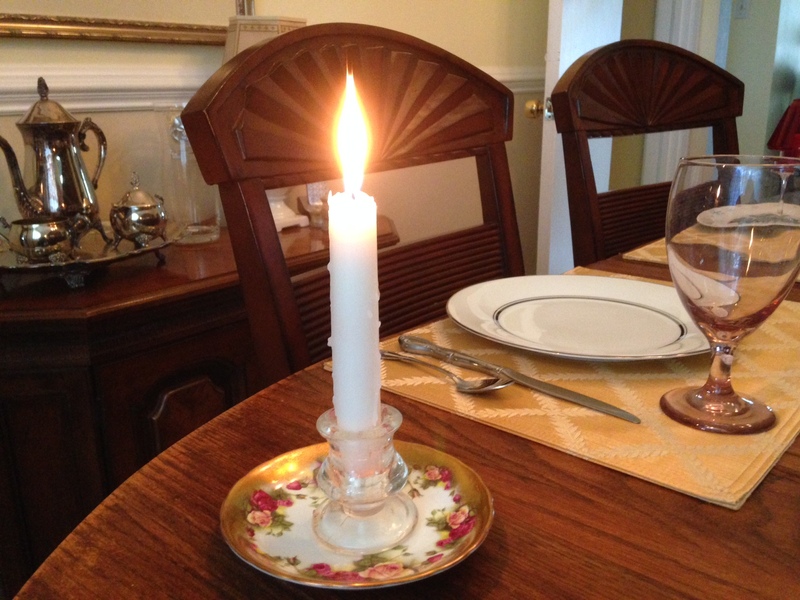 Nevertheless, the long, tapered candle is very short and stubby now. Yet the flame still burns brightly. Whether you are married or not, on this day I light a candle for you and whatever family relationship is most important in your life. Your thoughts, recollections, or advice are welcome here. Thank you! Oh what a beautiful post, Marian! Thanks for helping me to start the day with such positive, loving, and wise words. Happy Almost 49th Anniversary to you and Cliff! The photos are simply delightful–so full of young love! And thank you for honoring me with your early-riser comments. Every. Single. Wednesday! Thank you for the candle, Marian. To shine a bit more light on this world, no matter what the occasion, is so welcome. I got a nice warm fuzzy feeling (my oxytocin is flowing) when I read that. I\’ll piggy back on Merril\’s \”Happy Anniversary\” and wish you a fun next year as you plan for your 50th. I read your well-researched position piece this morning, first thing. I especially related to the mention of cognitive dissonance. Readers, Janet always has thought-provoking views on her website: http://janetgivens.com/blame-it-on-the-oxytocin/ Check it out! And thanks for the anniversary wishes, Janet. \”Once a day, notice the positive out loud: the way they look, something they’ve said, or done.\” This is so important. Each day, we make a point of thanking each other for even the tiniest of things. Happy Anniversary, Marian! I really enjoyed your wedding photos. Oh, Jill, thanks for commenting from Charlotte, NC, the site of our wedding. I wonder whether the church is still there. The summer before the big day I worked in the church office and kept cutting people off on phone calls. It\’s a wonder I wasn\’t fired. My skimpy salary helped pay for the wedding though. LOL! I believe the church is still there, Marian. In Statesville correct? I heard recently – wish I could remember the source – that marriages survive when spouses exchange 5 positive interactions for ever 1 negative one. In other words, the negative exchanges are inevitable, even necessary, but focus more on the positive and you\’ll make it. Sounds like you have manage that intuitively. Congratulations and beautiful relationship. Thank you for the vote of confidence. Speaking well to each other has not been at all intuitive. We are both strong personalities, have strong views, and used to hurt each other with words. After the first five years of \”combat,\” we decided to monitor our language. Since then, speaking well to each other has developed over time into a habit. Still, it\’s not always easy, especially now that we are moving and the pressure is on. Ha! Your advice also conforms beautifully to the research of the Gottmann Love Lab. https://www.gottman.com/about/research/ The four horsemen of the relationship apocolypse are here: https://www.youtube.com/watch?v=1o30Ps-_8is Contempt is the greatest predictor of relationship failure. You\’re so pretty! Cliff\’s not too shabby either. Those were the days, and you remember your pink bridesmaid dress at our wedding, I\’m sure. You blue, Jan yellow, and me pink, our bridesmaid color choices. Thanks for the compliment, sister! Love the way the exact moment was also caught on clock! Well positioned. But the wisdom you share on watching our words–so important. Priceless really. Well worth the time it took for me to check in here and read your post. I\’ve been AWOL lately because of family circumstances after the birth of our newest grandson last week in the city where you wed (had to go back to Levine Children\’s Hospital). He\’s doing ok, but it\’s up and down. Keeping mum on FB about that but wanted you to know. We had three months of up & down with Ian, who is thriving now. I understand the stress of observing a struggling young life. Hopeful prayers arise here, Melodie! Thanks for taking the time to read and drop your thoughts here, Melodie. LET them eat cake is right, Marian. For awhile, the tradition of all our college friends was the MAKE them eat cake: smash it in each other\’s faces, laughing, responding to the applause of the guests. I always cringed at that, and no, we did not do it at our wedding. My grandmother always said that wedding cake was the promises of the sweetness to follow. I like that. I realize that the Marie Antoinette reference is out of place here, but it seemed to fit the theme. Actually, Google searches contend that the quote is a misattribution. Your grandmother\’s wisdom holds with me too. We\’ll go with that, Marylin. Thanks! Happy anniversary, Marian. Your post is filled with wisdom. When moments get rough in a marriage, it\’s easy to focus only on what\’s wrong with our mate. One recommendation I read (and have used) is to write a list of \”The 10 things I love about (husband\’s name).\” It may feel difficult at first but each positive thought yields another and you come to remember why you loved that person in the first place. And still do. Then give the list to him. Many happy days follow. Thank you for the tip. I sounds like a great \”gift\” for our actual anniversary date, August 5. Thanks for suggesting a worthy journal activity, Carol. Such a lovely happy & inspiring post Marian thank you! You must have been a child bride 🙂 Happy anniversary and also for being a candle to shine a light. 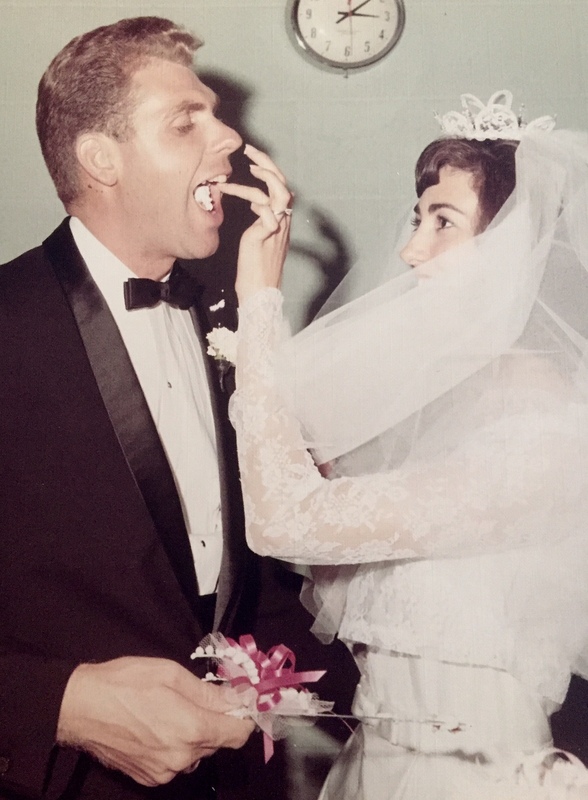 Here\’s to both of you for many more adventurous and loving years. I heard that the first 49 years of a marriage are the hardest – plain sailing from now on! Thanks for the chuckle and the good wishes. Actually, I married at age 26, which was a tad on the old side for brides of the era. Some of my high school friends married after graduation and others shortly thereafter. To ease the pain of moving just now, we\’ve gotten out a travel guide and focusing on a trip for our 50th. Congradulations on your up coming 49th wedding anniversary. You both look so beautiful then and still do today. I\’m entering 29th anniversary this month. I agree that kind response turns away wrath. Not that I have always followed it but I have never let our disagreements keep us upset or apart. I had two nephews living with us one day my husband and I got into an argument we both said or piece then started laughing and it was over. They were shocked one said titi I love your marriage you and tio never stay mad at each other even if you disagree. I told we can disagree what we can\’t do is stop loving your spouse. Everything eventually works it self out. We need many more examples of strong loving marriages. Thanks for the example, Gloria. I suppose once or twice we must have had a similar(laughable) reaction to a heated exchange. In our books, divorce is never an option. Our aim: best friends, best mates. As I scrutinize the photo now after all these years, I do savor Cliff\’s expression as gentle and tender, attributes I appreciate. Anita, I think you have passed the 50-year mark and wrote a beautiful post about this milestone. Right? Marian — I love your post today. What great relationship advice it contains regarding ever-powerful WORDS. This is not the first time you have quoted your wise mother. She is so right about our speech. Thanks for the reinforcement, as always, Laurie and for the share on Twitter. Happy 49th Anniversary! You both look adorable on your wedding day. (and still do) I agree, using the right words is very important to make a marriage work. That and a sense of humour!! A sense of humor is in the top three marriage savers in our marriage, for sure. I was first attracted to Cliff because of his sense of humor. But unless he proved to have good character, it would have been for naught. I suspect your hubby can roll with the punches too! It was his dry British sense of humour that caught my attention! Is that still the same candle?? 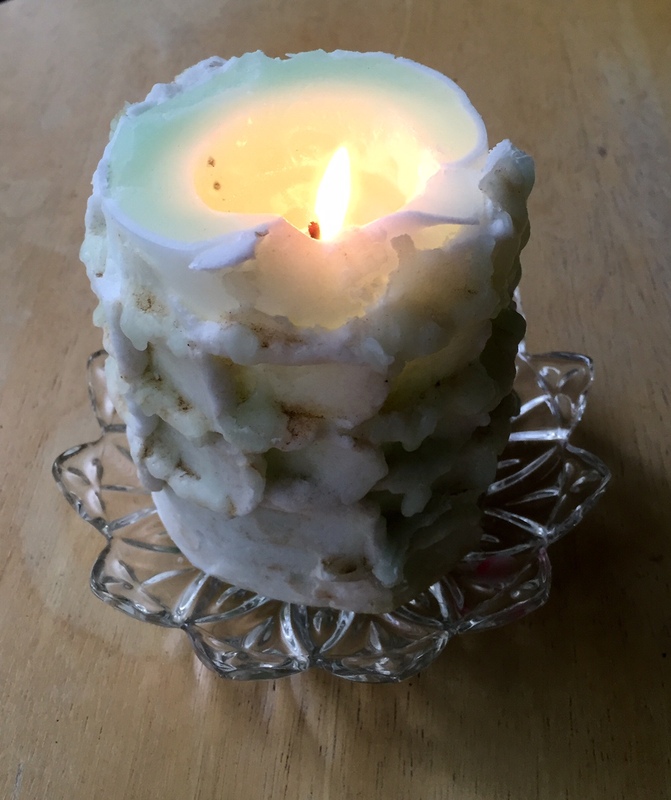 The squatty-looking candle that seems to boast dirty frosting is the original. Yes! Thanks for this post, Marian. You are one year ahead of us! I think hubby and I will both enjoy your post this time, as I\’m forwarding it to him, with no hidden agenda intended. We can both practise being kinder to each other even though we know that we love each other. It just makes the road smoother! Thank you for the share, Elfrieda. I suspect you and your husband have good communication skills; otherwise, you would have hesitated. Now I wonder about his response. Hmmmm? Happy Anniversary. May your candle burn brightly for many more years to come! Blessings. Thank you very much, Jenn. And I send good wishes back to you. I love your posts, often with quotes, and always with a rich narrative style. What a beautiful bride you were! Happy Anniversary! I\’m not married, but I your advice to notice and comment on one positive thing a day resonates with me as a school teacher. Once a workshop speaker at the college mentioned that negative comments imprint more deeply on our psyches than do positive ones – no surprise! That\’s why he suggested the \”sandwich\” method when making suggestions to students. Start with a positive, mention what needs to be changed, and then close with something on the plus side again. We humans have fragile egos and our self-esteem is often hanging by a thread. I guess you and I know well that ghastly \”inner critic,\” the bane of writers. Thanks for checking in here with wise advise, Luci! I remember the message of Words We Carry (0n my Kindle/Mac) and the effect the negative has our our self-esteem. It\’s interesting that 49 years of Cliff\’s positive comments to me have not erased completely the criticism I heard as a child. Oh, the power of the formative years, something you know all too well. Creme brûlée for us both. After the rich sauces of prime rib and too many trips to the salad bar, we were both in over-load. 🙂 Tea and crackers is all I need today. By any measure, 30 years is a long time. I think a sense and of humor must go a long way to help your the marriage \”engine\” run smoothly, if what I see in your comments is any indication. Brava to you both! Yes, celebrations went just fine, but today we are packing for the Big Move tomorrow – finally! Some good advice there. Congratulations on almost reaching gold! We have just passed silver. Congratulations to you and Commando. Twenty-five years is a milestone too. The fact that you and your husband spend both enjoying nature and walking is a good indication of many more years to come. At least you\’ll be healthy! What wonderful shots! And wishing you a magical and love-filled anniversary and many more happy years ahead. Your good wishes are always appreciated, Fiona. Thank you! I\’m visiting from Linda H\’s blog, where she has featured your blog today. I love this post. We\’ve been married 32 years, but I still value these reminders for myself and also to share with my adult children who are now married. Happy 50th to you and your husband! Love this post, Marian, and your recipe for a happy marriage. Here\’s to many, many more anniversaries!! Thank you, Joan. I envy you and Bill able to travel a bit now. Cliff and I feel like oxen tied to a big house we are trying to move. We long for the day we can take a breather. Somewhere with cooler temps sounds appealing. Your time for a breather is coming soon, I\’m sure. One day at a time! And thanks for the congrats!! Actually, we are doing just fine. We are both on two feet and yesterday my sister and her husband lent us a hand moving drawers. Counting my blessings but looking forward to sitting down and doing absolutely NOTHING! Lovely, Marian. Blessings on your already blessed marriage. My advice to my sons: Learn to disagree without saying words you will regret. (If you don\’t know how to disagree without mortally wounding, then the relationship is doomed.) Learn to request what you need without shaming or attacking. Say what\’s on your mind before it comes to a boil. If you\’re already angry, then let it rest before dealing with the mess. Tell the other person you love them often and give them gifts of love which they\’ll appreciate (a great Italian dinner from the garden for Vic). Be interested in their successes and equally interested and supportive of failures or perceived failures. Hug them often when they\’re up or down. Tell them your biggest secrets and fears. Trust. Take care of your lover when they\’re sick or sad. Grieve for them with your children or anyone who loved them. Take care of their memory and be grateful for the continuing love after they die. Now I\’m crying, so I guess I hit the core. You hit it right smack dab! If you were a medieval woman, I would suggest this as an illuminated manuscript with lots of gold leaf. Truly \”apples of gold in pictures of silver.\” Now I\’m going to think about how you can showcase these wise words elsewhere. These words could be the mission statement of many of your blog posts: \”Take care of their memory and be grateful for the continuing love after they die.\” You have made Vic live in your readers\’ minds though we never actually met him. (I know his voice from a video.) Well done, Elaine, and thank you!